I’m conscious that on a day like today, Monday, time is more precious than at other times of the week. I am very much, in the same boat. 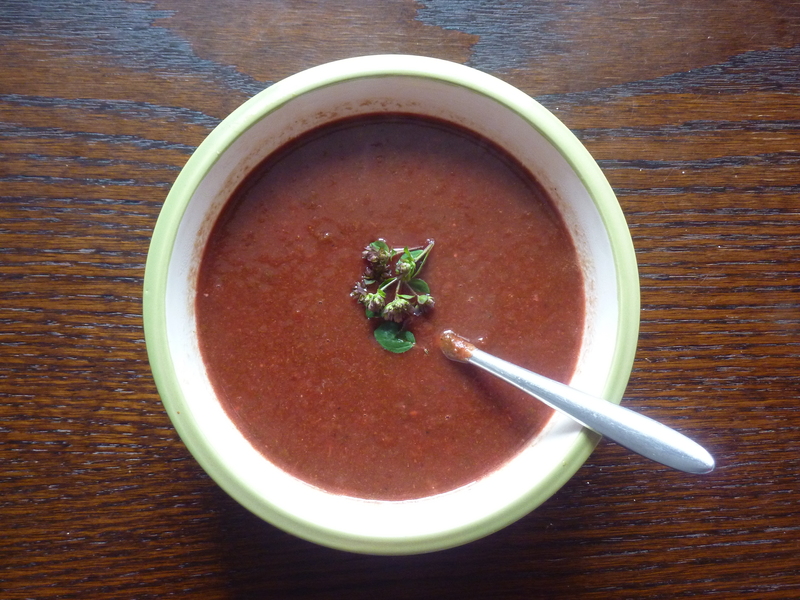 I made tonight’s soup as easy as possible, but did not want to compromise on deliciousness! The roasting part here adds unmistakeable sweetness and the bharat brings a spicy edge to the soup. We are in the middle of some very stormy and chilly days up here in the Beach House and soups seems like a very good idea. 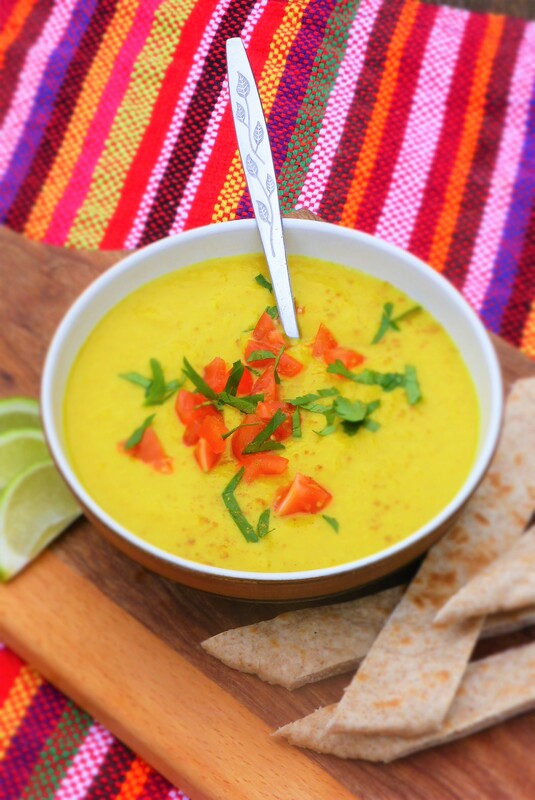 I love the bright colour of this soup, with added radiance from the turmeric. Its sunshine in a bowl and is a real lift when the sun is hiding behind the clouds. 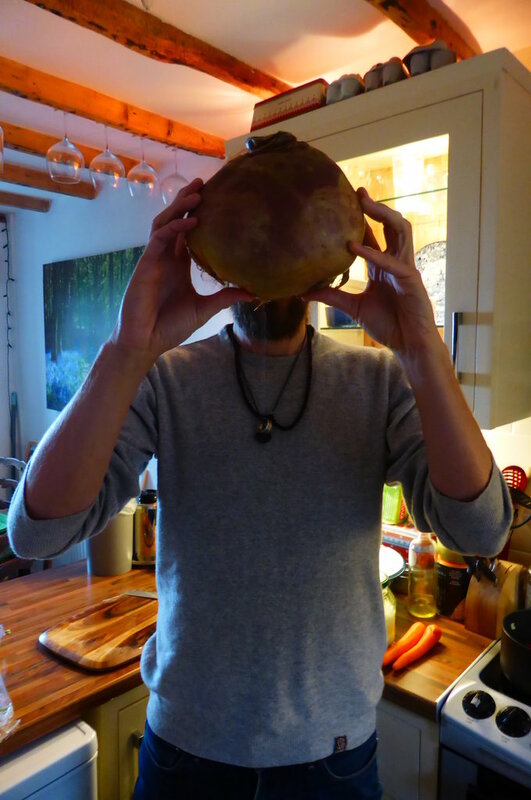 We’ve been celebrating a little after the release of ‘Peace & Parsnips’. 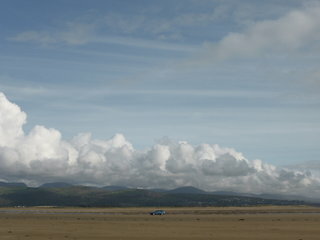 Jane and I took a trip down to Criccieth, a local beach and went down to Black Rock Sands for a proper bag of chips. There is an amazing chippy in Porthmadog that we frequent on rare occasions. Chips = celebration! We sat on the flat sands, a rare place where you can actually drive cars around on a beach without the imminent danger of sinking like a stone. Black Rock Sands reminds me of beaches in Australia, or what I imagine the tip of South Africa to look like. 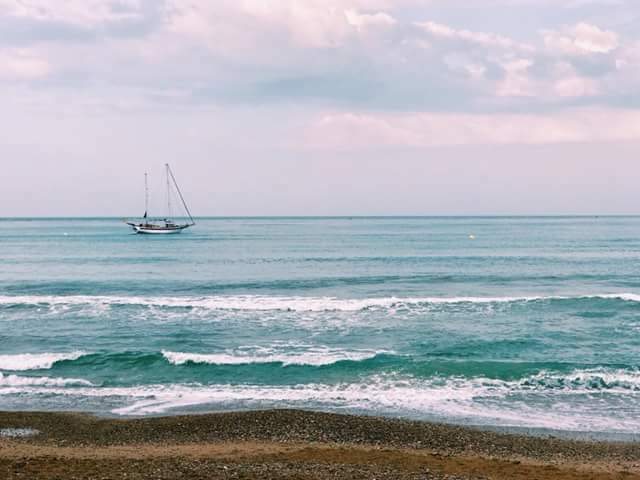 You can look out over maybe a kilometre of flat sand before you see the sea. A truly beautiful place to scoff chips! Is basically a spice mix from the Middle East, as well as Turkey and Iran. Although the ingredients may vary, some usual suspects are: black pepper, cardamom seeds, cassia cark, nutmeg, chillies, cumin seeds, coriander seeds. The baharat we use is very much a Middle Eastern style, in Turkey they add a lot of mint and in Tunisia they make a mix with rose petals, cinnamon and black pepper. There are an almost infinite number of combinations of spice mixes, but most of the baharat sold in large shops in the UK is similar. More a warming spice mix than a turmeric or chilli driven one. If you don’t have any Baharat around the kitchen, use the same amount of Rae El Hanout or Garam Masala. 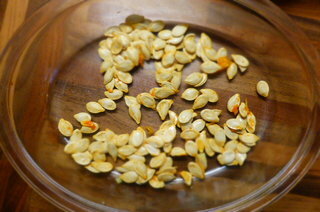 They will add a similar spice kick to the background of the sweet peppers and squash. This soup is as easy as roasting a tray of very roughly chopped vegetables and blending. Grab a large baking tray and rub a little oil over the squash and peppers. Pop them in the oven for 20 minutes. 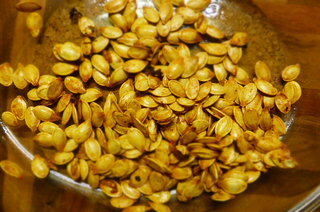 Rub a little oil into the garlic cloves and take the tray out of the oven and scatter the garlic cloves onto the tray. Pop back into the oven and roast for another 15 minutes. Take the garlic and pepper out, check to see if the squash is nice and soft, if not, put back in for another 10 minutes. 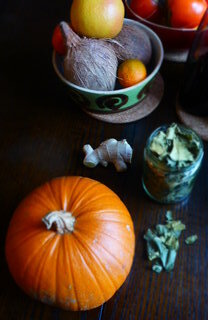 Set the garlic and pepper aside to cool, do the same with the squash once it is lovely and softened. In a large sauce pan, add 1 tbs olive oil and fry the onion on a medium heat for 6 minutes, until translucent and soft. While the onions are on, peel the skin off your peppers, garlic and squash. Chop them all roughly. Add the spices to your soft onions and stir for a minute, then add the squash etc. Pour over 1 ltr of hot water and check seasoning (add salt as needed). Leave it to simmer for 5 minutes before blending the soup with a stick blender or using a food processor (leave the soup to cool a little beforehand for this). 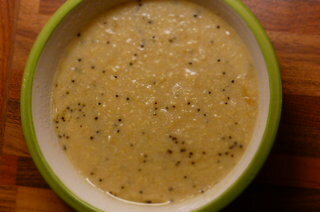 A nice idea, for added richness is to stir some tahini into the soup. 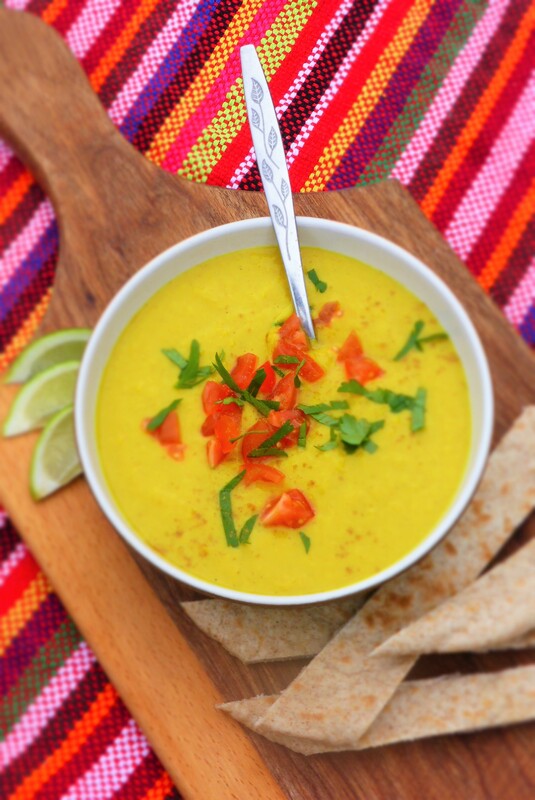 Tahini is also packed with goodness, so nutritionally the soup becomes a real shiner. If you are going all out tonight (it is a Monday after all!!!) chop up some coriander leaves and finish with little sprinkle of baharat. Butternut squash is one of the healthiest veggies you can eat. It is much lower in calories than potato and leaves you feeling nice and full after eating it. Calories are of course only one part of the dietary picture, counting calories is definitely not our thing (big bags of chips and all!) You can tell by the colour that its loaded with some good carotenes, which are ace anti-oxidants. Squash is also good for vitamin C and is high in dietary fibre. 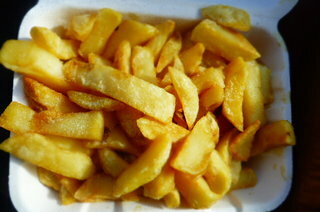 And who can forget……the glorious CHIPS! Here we have a delicious 10 minute meal. 5 minutes chopping, 5 minutes cooking and it won’t last long in the bowl either. So simple, yet tastes so amazing and dare I say it, complex. You have to love that! Nothing says British winter more than a bowl of Soba Noodle Broth….or is that just me! 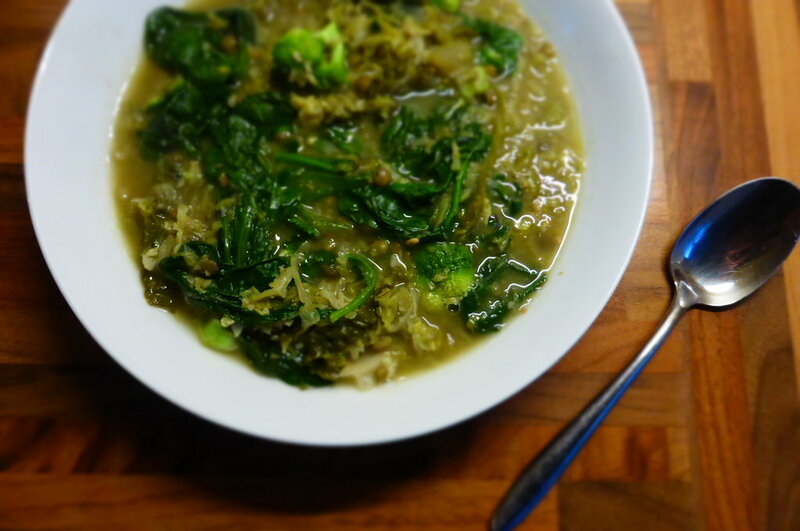 I love a noodle broth anytime of the year and this one is wonder, putting the years first brussels sprout to good use. I could eat this by the bucket full, bowls just aren’t big enough. 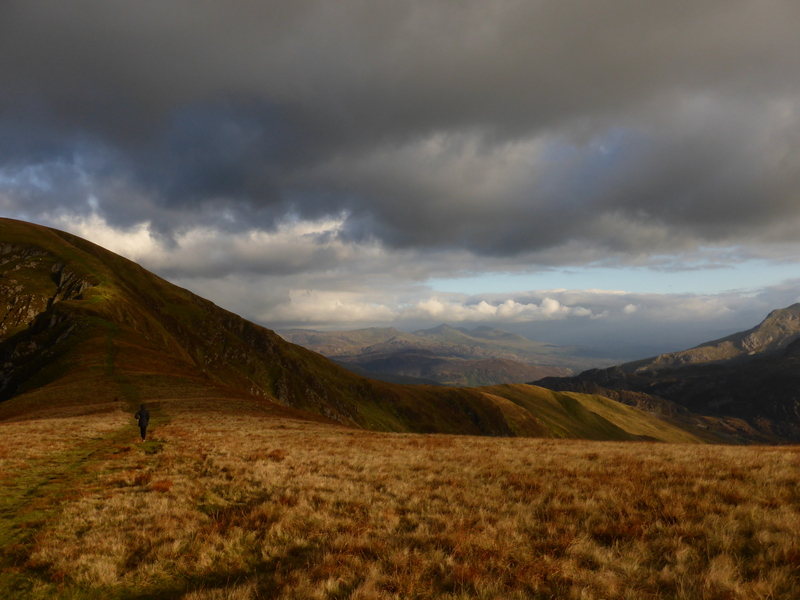 The first winter chills are definitely visiting the Snowdonia hills at the moment, the winds blows a gale and we’ve kissed goodbye to what was a lovely summer of warmth and light nights. Sitting in the garden at 10pm in the sun is surely a thing all Britons cherish. As are brussels sprouts. They’re like little cabbage hand grenades and add a punch to all they grace, we love ’em! So, so, so very wasted on your average Sunday Roast (traditional British Sunday Lunch containing roast meats and unfortunately over cooked vegetables), boiled to death and flaccid. 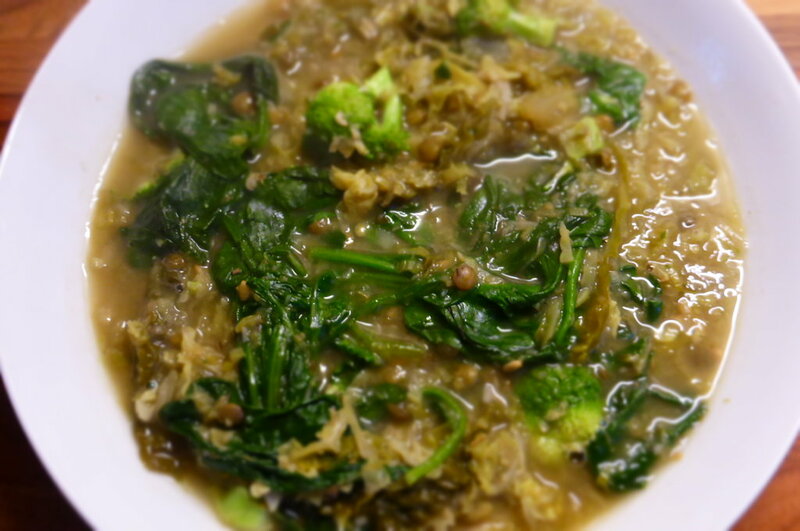 A quick blanch in this broth and they are a revelation of crunchy texture and potent flavour. This is an ‘Asian’ broth, which I know covers a large chunk of global cuisine. Its a hybrid of flavours that meld and work. Some Japanese, some Chinese, but all super tasty. In the Beach House we condone slurping in all its forms. Food should be eaten with gusto and vigour, slurping is an essential part of the noodle broth experience. We like to attack a bowl of noodle broth armed with a large spoon and some chopsticks, on occasion we resemble koi carp, such is our commitment to the cause. Jane is a particularly good slurper, we put it down to being raised with a koi carp named bonehead. 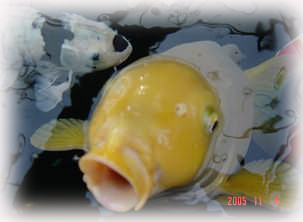 Bonehead still lives with Jane’s Mum and Dad and is a big fish in a small pond. He can also be stroked like a dog. This type of broth is best served piping hot, with all ingredients cooked for the minimum length of time. Freshness and crunch is imperative. The gulping and slurping actually helps the noodles cool down on the way to the mouth. At least that’s our excuse! It also happens to be alot of fun. We’ve added plenty of colour here, essential in these gradually greying months, by using the last of the years red peppers and some brazen red cabbage. This broth is also nice and warming, fresh ginger and Chinese five spice take care of this. For even more of a restorative slurp, I added some wasabi to mine which really got my juices flowing. Soba noodles are always a highlight, soba meaning ‘buckwheat’ in Japanese, the noodle choice of most Tokyo-ites. 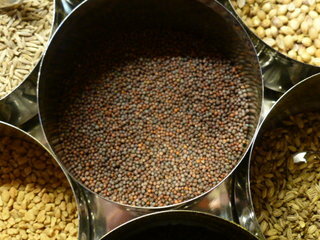 Traditionally in Japan buckwheat can be harvested four times a year, a wonder crop for sure. Soba Noodles have a lovely bite to them, a hearty noodle ideal for my rapidly diminishing wheat intake as they are made with a large amount of buckwheat (not a wheat even though it is called a wheat!?) This means less gluten all around. For some bizarre reason, soba noodles are normally a tad more expensive than your average joe noodle, but they’re well worth the extra pennies. We use tamari because we prefer the flavour, it contains no wheat and is always made to a certain standard. Meaning no strangeness and dodgy health issues with the soya used. There are alot of ingredients in the broth here, really, some good stock, ginger and a splash of tamari will suffice, the other ingredients just make it extra special. Most of them can be found in any decent Chinese-style food store. As can the Hazelnut Tofu. 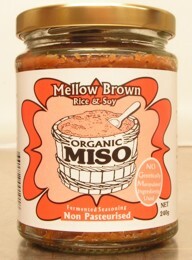 It’s basically tofu mixed with hazelnuts, and a few toasted sesame seeds, pressed back together. It is delicious and has plenty of flavour, unlike normal tofu. It seems to be springing up in some supermarkets, but as with most of these niche veggie/ vegan bits, a health food shop is your best bet. Taste the stock, make it right for you. Boil a kettle with enough water. Add boiled water to a large, warm sauce pan and get a steady boil going. Bubblin’. Add all of your stock ingredients in no particular order, give it a stir (no stock powder lumps, they are the enemy). 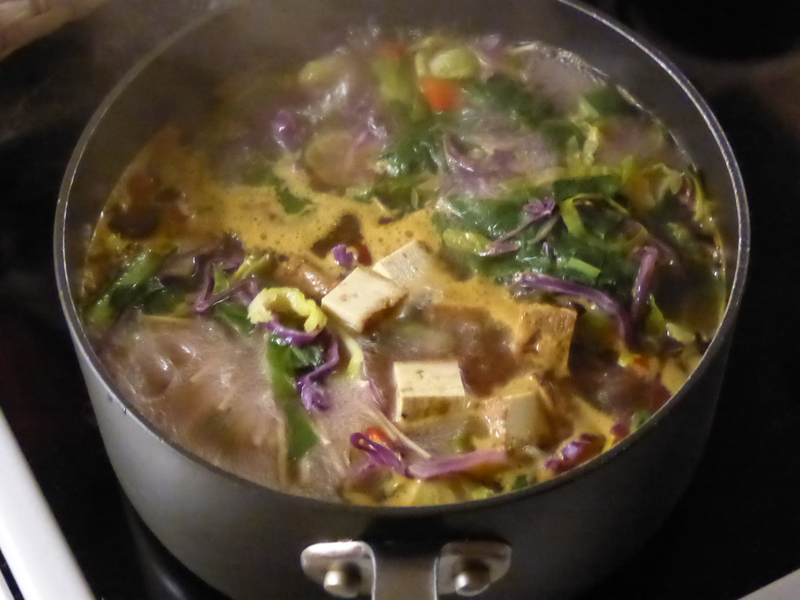 Now add your cabbage, brussels sprout and peppers, boil for two minutes, then add your tofu and noodles, simmer for a further two-three minutes and prepare to serve. By the time you’ve got bowls and ladles and all that jazz together, your noodles should be cooked nicely. Overcooking soba noodles is a huge sin. Piping hot and topped with a handful of sliced spring onions. If you have a small flask of warm sake available, well done! Have extra tamari, wasabi and vinegar on the table so people can play with the flavouring or their stock. 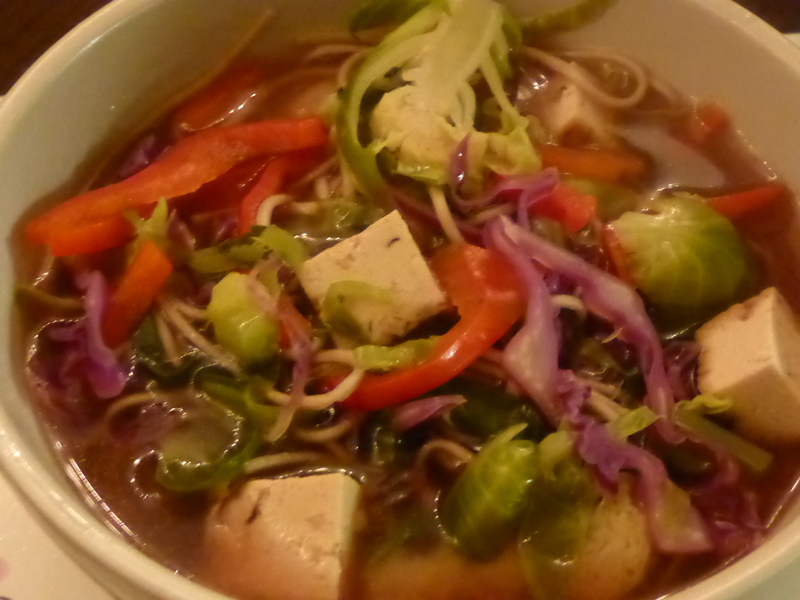 Hazelnut Tofu and Soba Noodle Broth with Red Pepper and Brussel Sprouts – Camera in one hand, large spoon in another……. Soul slurping of the highest order and buckwheat noodles to boot. Lucky us. So quick and satisfying, we could eat this for dinner every night! A soulful soup of the highest order. Buckwheat is high in Thiamine and soba noodles were regularly eaten by wealthy Japanese folk to balance their large intake of white rice (very low thaimine) thus avoiding what was called ‘beri beri’. As we all know by now, buckwheat is a relative of rhubarb! 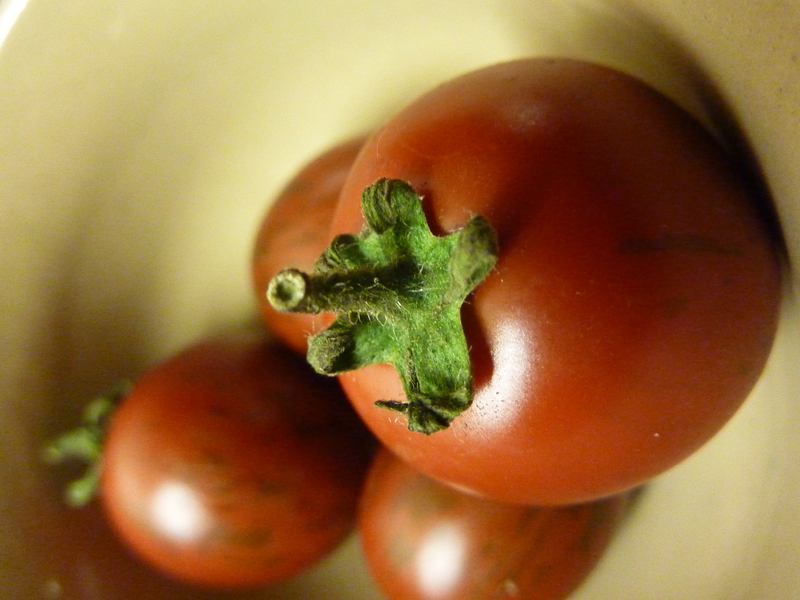 A berry and not a grain, a wonderful gluten-free substitute. Buckwheat is full of flavanoids which are very good for the cardiovascular system. In fact, some folk say that buckwheat is better for you than any fruit or vegetable. Quite a claim! We regularly have an identity crisis with dishes, turning traditional fare on its head, ‘Beach House-ing’ things you could say. We don’t mean it, no offence to the original recipes and food heritage in question, its just we like to play in the kitchen. Here’s another traditional recipe we have messed about with, thankfully the results were rather delicious. The best harira I have ever had was for breakfast (regularly) in the village of Chefchaeoun, known to many a traveller for its exceptional soup, jalaba (hooded cloak garment worn by most Moroccans) production and wonderful mountain location. 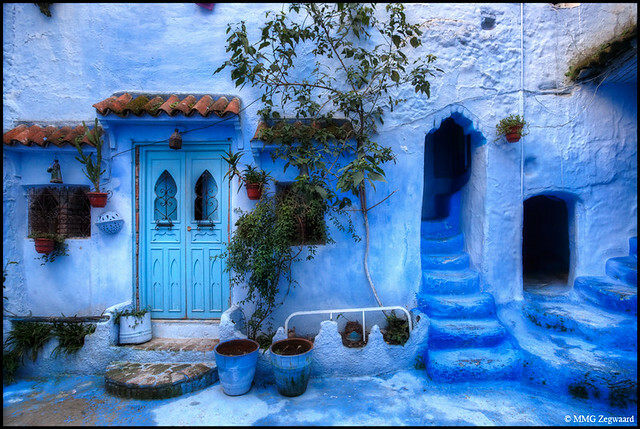 Its small winding streets hide many a wonderful eating experience, rows of blue houses (yes blue!) 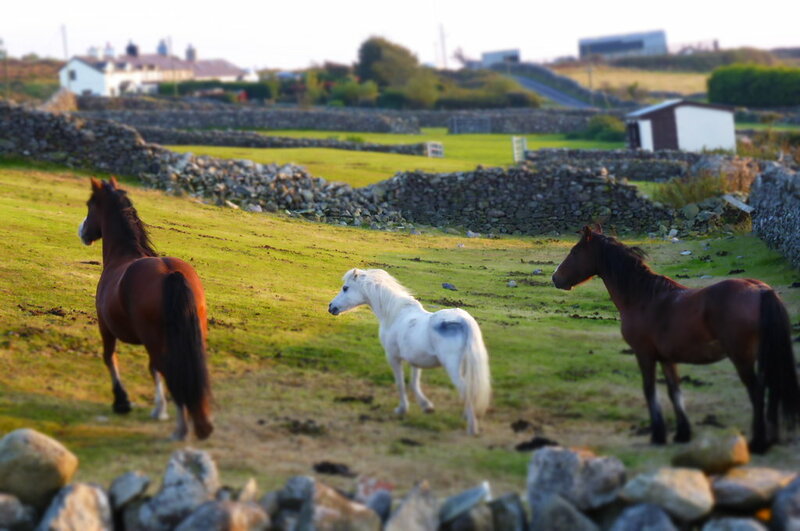 make this one of the most distinctive and stunning villages in that vast old land. I moved there for a while, took up residence in a room situated on the walls of the Hamam (the communal bath), the warmest room in town. You see its high up there and you wake chilled to the bone and needing a serious bowl of spicy sustenance. Abdullah provided. He was a wonderful cook, in nothing more than a space between two buildings, a few squat tables and two gas burners with huge steel pots, Abdullah created the authentic Moroccan dining experience for breakfast, lunch and dinner. It was like a French Bistro without the pretense and price tag. My kind of joint for sure. For a few pennies, Abdullah would dish you up an epic bowl of full-on morning ammunition, sometimes with a tooth-less smile that shifted the early morning fug. 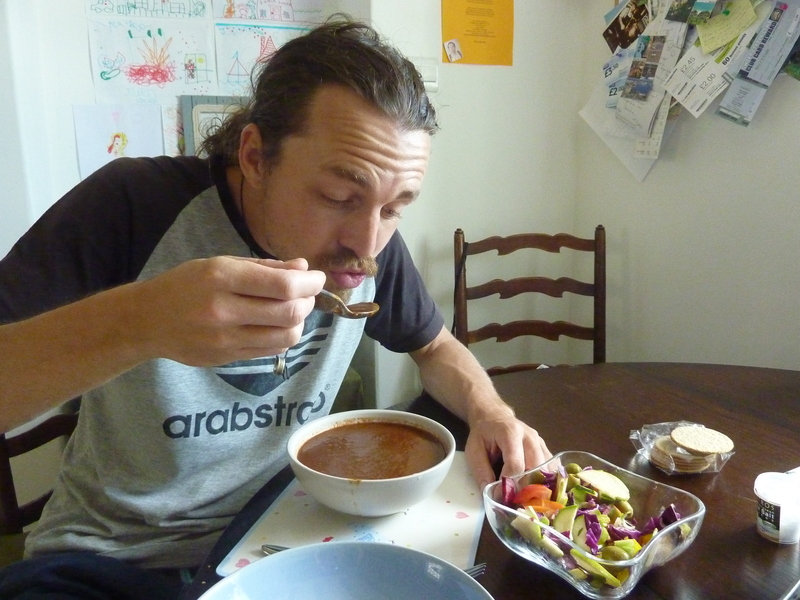 This hearty soup fuelled me on many a hike around the Rif Mountains and also on days spent lounging around playing card games with other punks holed up there. 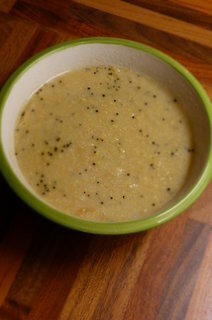 It came with a wedge of steaming flat bread, fruity olive oil and a small bowl of freshly ground cumin to use liberally. I sat wearing my Jalaba (the over enthusiastic tourist that I am) eating with the local men in silence, canteen style. No women. In Morocco cafes and restaurants seem to be a male only thing. I like cooking soups, its a soulful pursuit. You don’t have to be to precious, there are rules, but not many, a little like Morocco itself. This is the situation where I feel nice and comfortable. Add just 2 cups of water to make this a hearty stew. 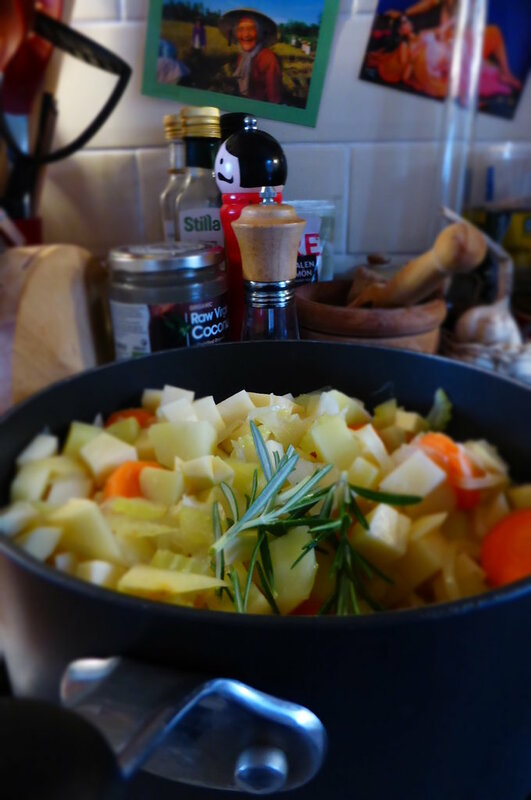 As with all soups/ stews, depending on the quality of your veggies, you many need to add some vegetable stock if the flavour is thin on the ground. Here’s to you Abdullah. Peace be with you. Hamdullah! 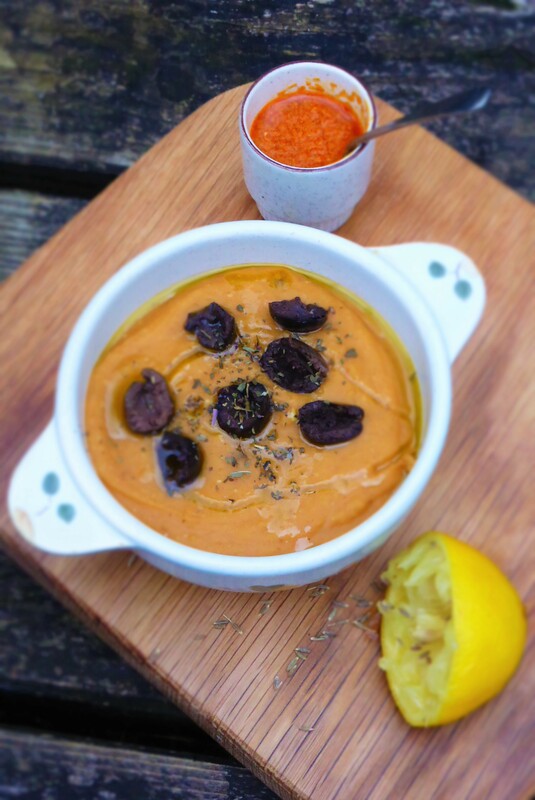 Soak your chickpeas overnight in a saucepan. Drain and refresh with new water, well covered. Add 1/4 teas bicarb of soda (this makes them soft and cook quicker), bring to a boil and lower heat. Vigorously simmer for 20 minutes or until chickpeas are tender. Warm the oil in a thick bottomed sauce pan, add your onions and cumin seeds and saute the onions for a few minutes until glassy, add garlic, pepper and ginger, stir for a couple of minutes and then add all chard stems (add earlier if they are a little tough), flour and spices, stir and warm through for a minute and now add your tomatoes, dates, lentils, tomato paste, warm through for a minute then add your water/ chickpea juice. Bring to a rolling boil and turn down heat to the lowest setting, add your chickpeas and leave to simmer for 20 minutes. When ready to serve, bring back to just about boiling, add your chard leaves and coriander stems. Re-cover and allow to cook for a few minutes. Check seasoning. A lemon wedge, topped with coriander leaves and a good glug of good olive oil. Add green olives and brown rice to the table if you’d like to make this dinner. For a special touch, we have it sprinkled with roasted and chopped almonds. 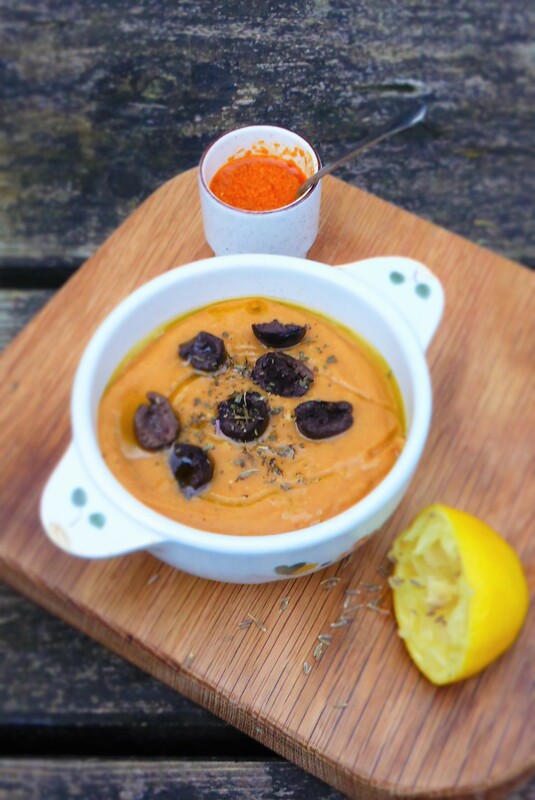 With winter lurking up the hill, we are getting back to our hearty soups. Harira is definately one of our fav’s and it is very cool when you have pleasant memories attached to a dish. 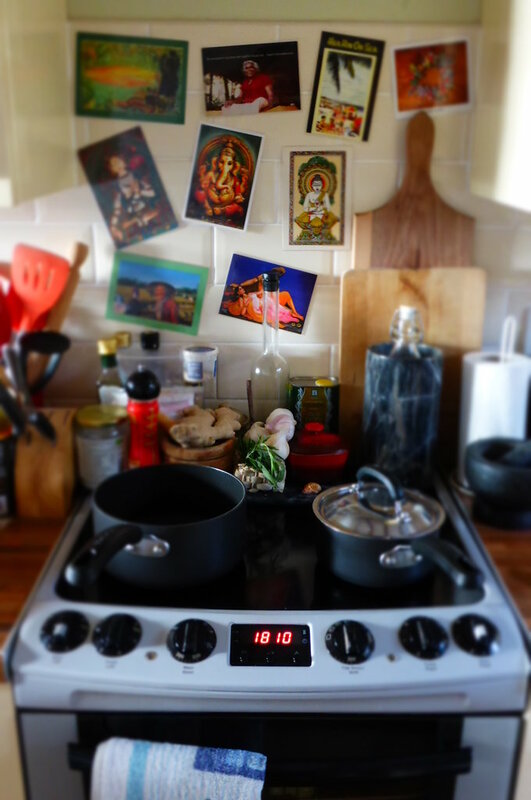 Food has amazing transporting properties, the sights and tastes so evocative and alive in memories. Spices are much more than just incredible tasting, the vast majority boast some quite brilliant health properties (as long as we don’t burn them in the pan). Turmeric is a root similar to ginger and in its raw state has very potent flavour, its wonderful stuff. Dried is the best we can normally do on this island. It is peppery and sweet, warm and bitter and has even been likened to orange peel (if very fresh indeed). Now the nitty gritty and real magic. Turmeric is anti-microbial, anti-flatulent and strongly anti-bacterial. POW! There’s a mini tornado blowing around the Beach House today, that can only mean one thing, the soup pan is making an appearance. It’s the kind of day when you want to ignore the inclement weather and get cosy by the fire with lashings of soup and preferably a cat and loved one (not in that order of course). So we’re staying in and making a spicy soup. ‘Mulllll-eeeee-gahhh-townnnn-yyyy ‘ is such a great word, it’s a meal in itself. For many years I’ve preferred the word to the soup, it always seemed like a half-hearted attempt at spicing a bland soup up, but always had the potential to be a real star. We wanted to give the tired old Mulligatawny a touch of Beach House lovin’, add a little tickle and zing to predictable proceedings. The spices here make it rock and warm with a zestiness and aromatic tinge that tingles the palate (coming mainly from our pal the coriander seeds), there is also the lovely sweetness of the raisins and parsnips paired with the warm flavours of the garam masala. The mushrooms here were a late addition and do tend to make soups a little on the grey side. I don’t think they added a great deal here and could easily be omitted. 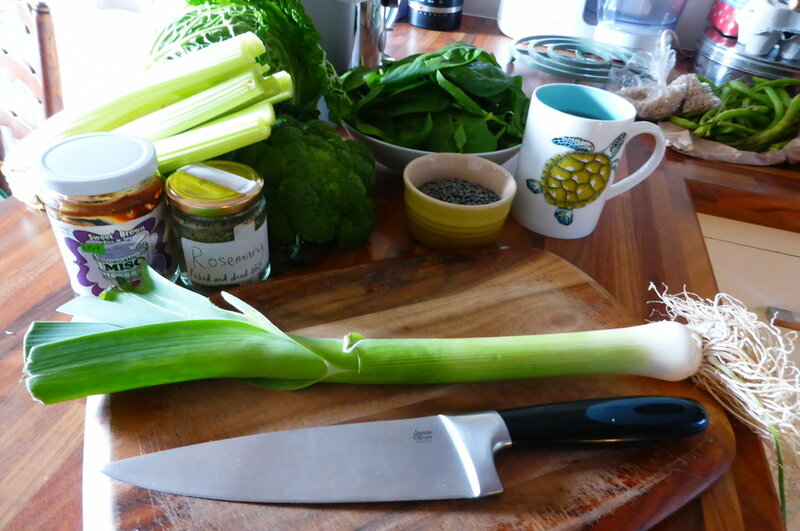 However, the highlight by far of this little number is our own leeks making an appearance. The Beach House Garden is hardly prolific, but it has given us some gems to savour and these little leeks were wonderful. The name ‘Mulligatwany’ actually comes from two Tamil words (a state in the south east corner of India) meaning ‘pepper’ and ‘water’. 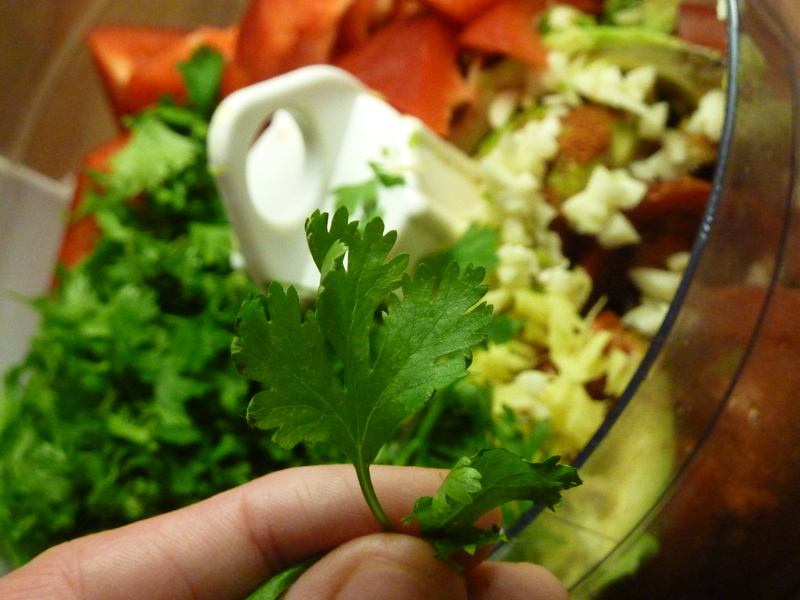 If you don’t like coriander husks, try and pick them out before blending (this goes for the bay leaves also). They can be a little tough and catch in the throat, which doesn’t really bother us. Once more for luck and laughs, ‘Mulllll-eeeee-gahhh-townnnn-yyyy’. Makes one big pan full, enough for four with possible leftovers. Hoorah! In a large saucepan begin to soften your onions for 3 minutes, then add your leek and garlic, fry gently for 3 more minutes then add the rest of the vegetables and spices, stir in and heat for a couple of minute to get the spices warmed, then add your stock to a lovely low hissing noise. 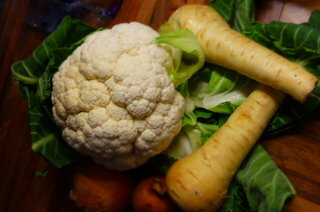 Bring to a gradual boil then cover and simmer for 40 minutes, until the veg is nicely tender. Blend soup (taking out bay leaves and as many of the cardamom pods as you can fish out) and serve warm. This soup keeps well in the fridge for days and should be nice thick texture, it may need a little thining out with water. Warm but not too warm (too much heat hides the flavour a little) and plenty of rough brown bread (recipe here). 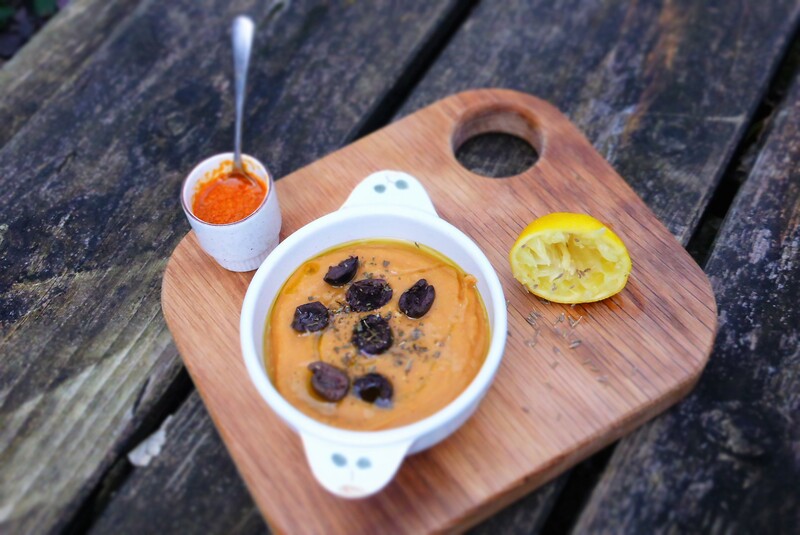 A drizzle of yoghurt/ sour cream is always a pleasant addition, a vegan cashew cream would also be quite amazing. 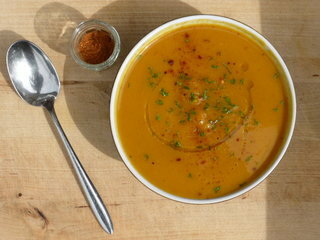 Proper rustic, hearty soup with a warm spice underbelly and punnet loads of aromatic flavours. Most definitely a meal in a bowl. Aforementioned cat doing what they do when Tornados blow outside. We have so much to learn from these fur balls. The great thing about parsnips, living in Wales, is that they actually need a good frost to grow well! No shortage of that up here. Parsnips are high in sugar, similar levels to that of banana and they are a great source of dietary fibre. 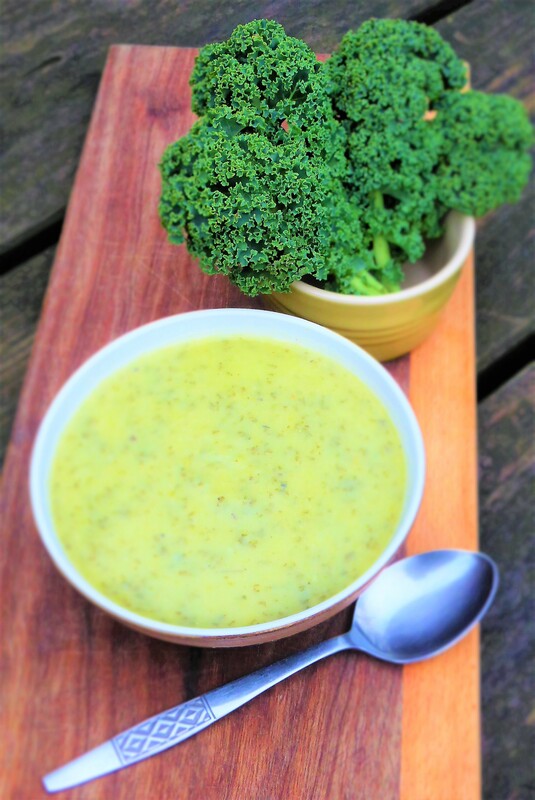 A soup with a kick and a tickle that is bound to get you buzzing this winter. 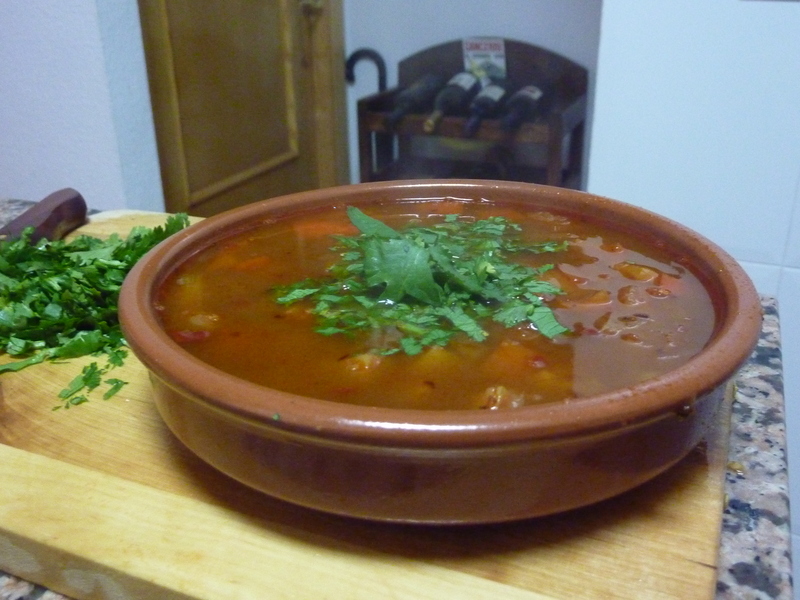 A real Sopa de Espana here, all ingredients coming from the Mazarron area. 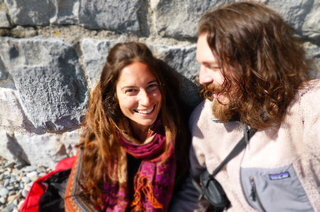 Many people have asked what the heck we are doing going on a three month holiday. Who one earth do we think we are?!!!!!etc….. Well, we’re making soup; and other things. 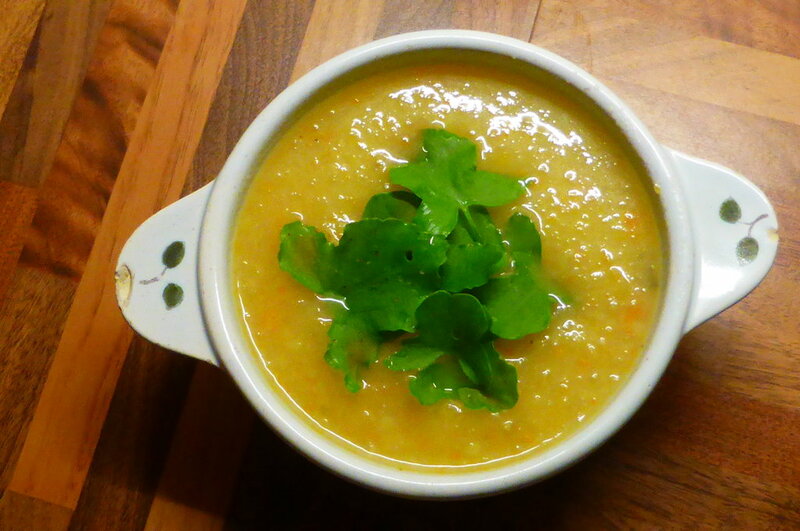 This soup sprang up from a little potter in the kitchen and rifle through the veggie box. It’s not snowing in the bay, but it can get slightly chilly some night fall. Here in Murcia, people are wrapped up warm, scarves wrapped around their faces and big thick coats are all the rage. It’s 18-24 degrees! It makes me smile and also admire the resilience of the good folk of Britain and other cold parts of the world. This soup is an offering from the Beach House Kitchen to all those shivering and sniffing their way through with a smile. Noras are little dried red peppers sold all over Spain and normally used when preparing stews and soups. They add a lovely sweet, peppery tang to all they touch and remind me of the wonder food of Mexico, where the dried chilli is king. Dried peppers come in many shapes and sizes, some large black and sticky, some dark red and spicy. Pimiento is another word for pepper, red pepper, we love it because it sounds so Spanish! We are lucky (we know this!) to have wild thyme growing in the ramble (dry river bed) below our home. Splashing a little olive oil on the top of a soup really adds richness to proceedings, olive oil is of course ubiquitous with all things Spanish food. It’s crops up in biscuits, cakes, shower gel and even amazing crisps (crisps fried in olive oil seems so decadent!). We need alot of calories and fat in winter months when the body is trying to keep us from perishing! Olives lend a hand here. My friend Chris, who lives here swears by it and claims bread is ‘merely a vehicle for olive oil’. The veg. stock we used here came from last nights dinner, the water used for cooking potatoes. Such a shame to throw it away, it is packed with flavour. 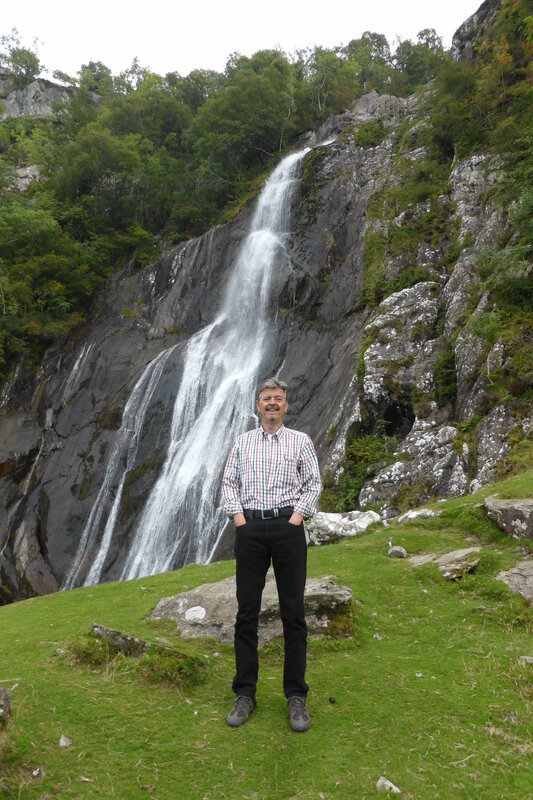 Back in Wales, we’d blend this together with a hand blender, soups with potato in always blend amazingly well. They go very creamy and full. Here, we enjoyed the texture of the lumps and chunks, listening to Ravi Shankar (r.i.p. 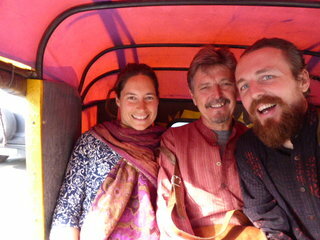 Ravi ji) and toasted our friends and family on the grey island, hoping they were all cosy and shiny. This recipe makes one big panful, enough for approx, 6 decent bowlfuls. 1 onion (sliced), 1 stick celery (sliced), 2 large potatoes (firm variety/ cubed), 3 noras (finely sliced), 2 large tomatoes (skin them if you have the time), 2 heaped teas smoked paprika, ½ teas chilli powder (we used a fresh green chilli named ‘Pimiento Padron – Shepherds Peppers’. Que rico! 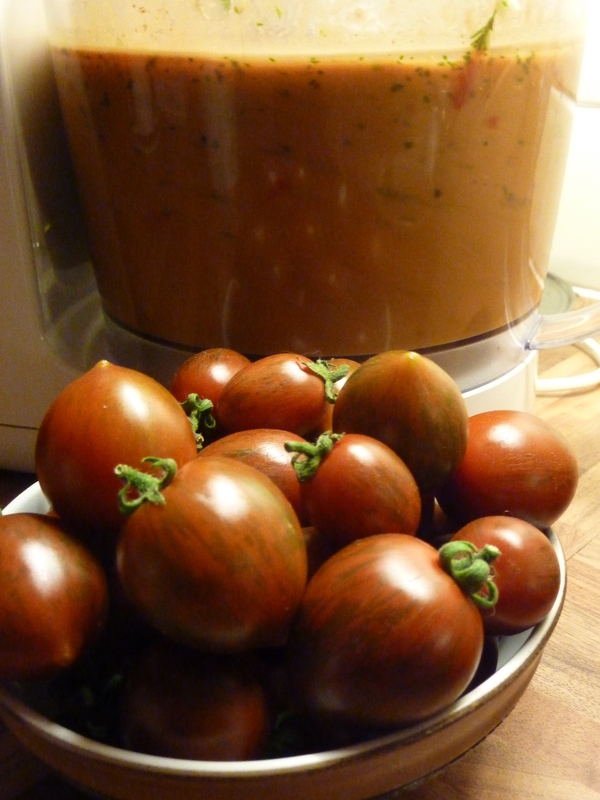 ), 1 tbs balsamic vinegar, 1 teas fresh thyme, approx. 1 1/2 -2 litres good veggie stock, 1 big handful coriander, good extra virgin olive oil, sea salt and cracked pepper to taste. In a large soup/ saucepan heat a little oil, begin to sweat off your onion. After the onion becomes glassy and soft add your noras and cook for 2 minutes, then add your paprika, thyme and finally your balsamic vinegar. This will begin to bubble and evaporate, stir well and get all the ingredients nicely involved with each other. If things get a little sticky and dry, add a splash of veggie stock to loosen things up. Season nicely. Now for the potatoes and peppers, cook for 5 minutes until softened, then add you tomato and cook until the tomato has broken down and formed a sauce like consistency. Then add your stock and stir, bring to the boil and cover. Cook for 20 minutes until the potatoes are very tender. 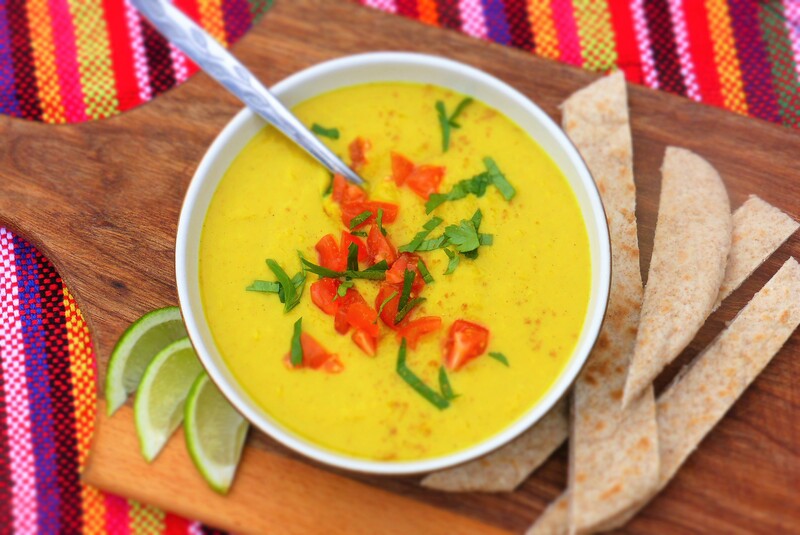 Piping hot, topped with a handful of coriander, a splash of olive oil (a la Espana) and big cry of ‘Buen Provecho!’ My thing with soups is, not too hot! Firstly you’ll burn your poor mouth and secondly the flavours come out a little better when the soup has cooled a tad. 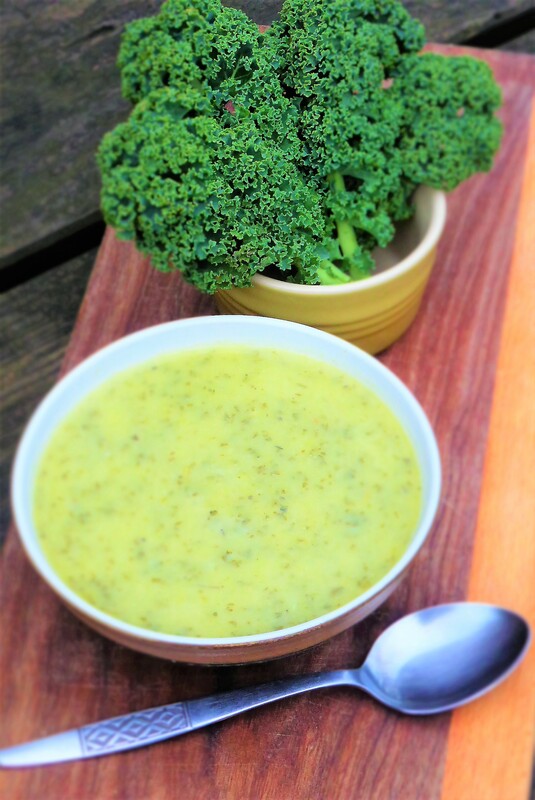 Even though we are not freezing and are wearing our shorts, we know this soup would hit the spot in our little wintery cottage back home in Wales. 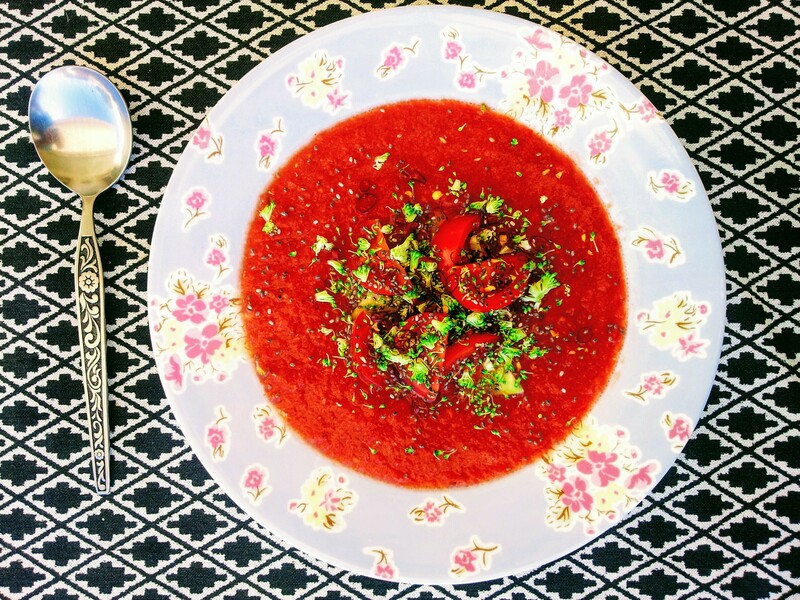 A lovely tangy soup with all the joys of a fiery chilly kick. Wicked winter warmer. Paprika (or Pimenton) is a superb, bright red spice used in traditional Spanish cooking. There are several different types of Paprika; namely spicy, sweet, smoked or combinations of the above. Paprika is made from dried and ground red chillis, traditionally peppers were dried under the sun. One of the finest areas for Paprika in Spain is Murcia, the region that we call home. With beetroots like these who needs spinach?! Or something like that anyway. 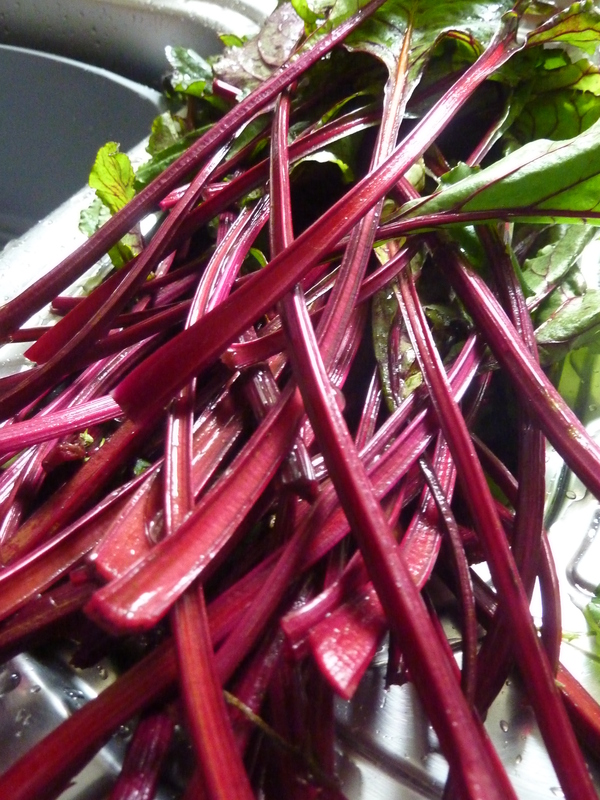 With a regular supply of these beauties almost year-round you can expect alot more beetroot dishes on the BHK! 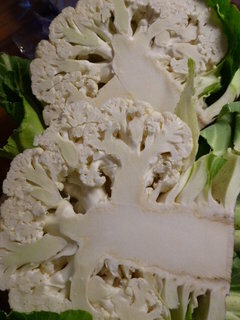 Really though, it is my favourite veg. I know that is a bold statement for a veggie lover. 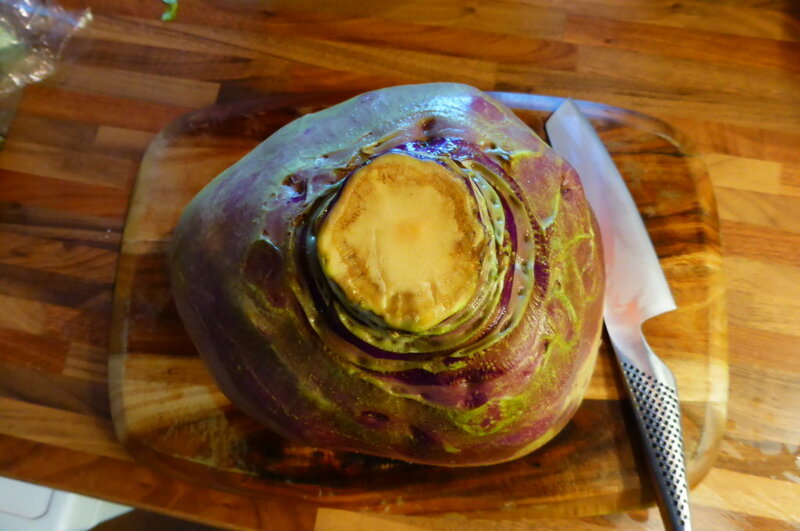 The ‘root is such a magnificent purple thing, but the leaves are just as good and this soup recipe puts them to good use. We normally chop them up and put them into salads, so this is a nice change. Now, the vast majority of Beach House readers are from over the pond, that is to say the USA. We love you guys and must translate a little here, you may know these leaves as beet greens and beetroots are of course beets. I like the name beets and beet leaf has a much better ring than beetroot leaf, but I must stay true my small island roots. The beetroots we are buying at the moment from the farm all come with at least five crisp leaves and beautiful crimson roots. You can really see the similarity with chard, especially swiss chard, they are all one big happy family. As with most plants, the leaves contain more nutrients than the roots, one more reason to never, ever throw them away (I hear of people doing this). What a waste! 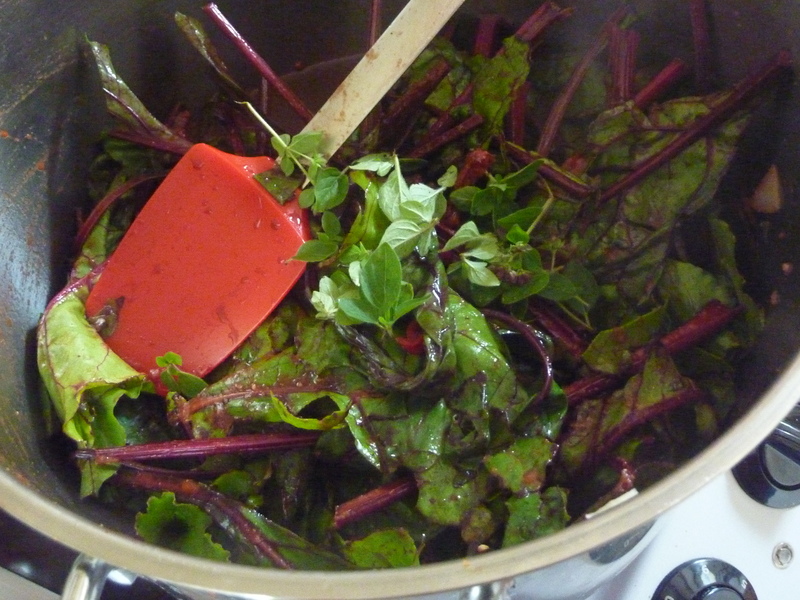 This is a basic soup recipe and the beetroot leaves can be substituted for beetroots themselves, or most other veg. 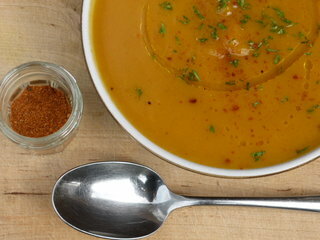 This is a classic soup base that allows you to use up any veggies that you have hanging around. As with most soups, its better the day after. The flavours really come together and the piquant tomato flavour really comes through with the balsamic adding a lovely sweetness. I decided on oregano here, because it is blooming at the minute in the herb garden. 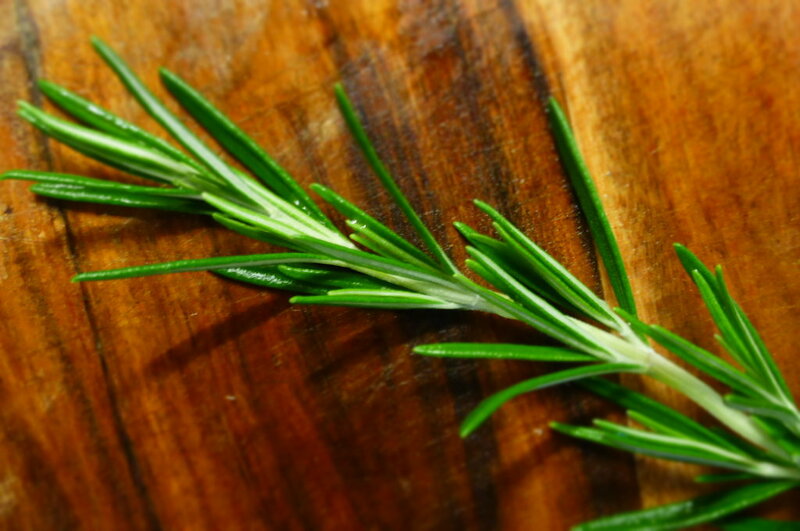 You may prefer to use thyme or even rosemary would go nicely. We made a big vat of soup here, feel free to half the quantities for a more modest pan full. Heat veg oil on medium in a suitably large pan, add onions and soften for a couple of minutes, add celery and carrot and continue cooking and stirring for a couple more minutes. Then add cumin, garlic and balsamic, allow the vinegar to evaporate (getting rid of most of the acidity) then add you beetroot leaves and season with salt and pepper, stir in well. Cook for a few minutes and when the leaves are wilting add the tomatoes, the oregano leaves and the puree, stir in and heat through, then add your stock and bring it all to the boil. Lower heat and cover, cook for 20 minutes, until all veg is tender. 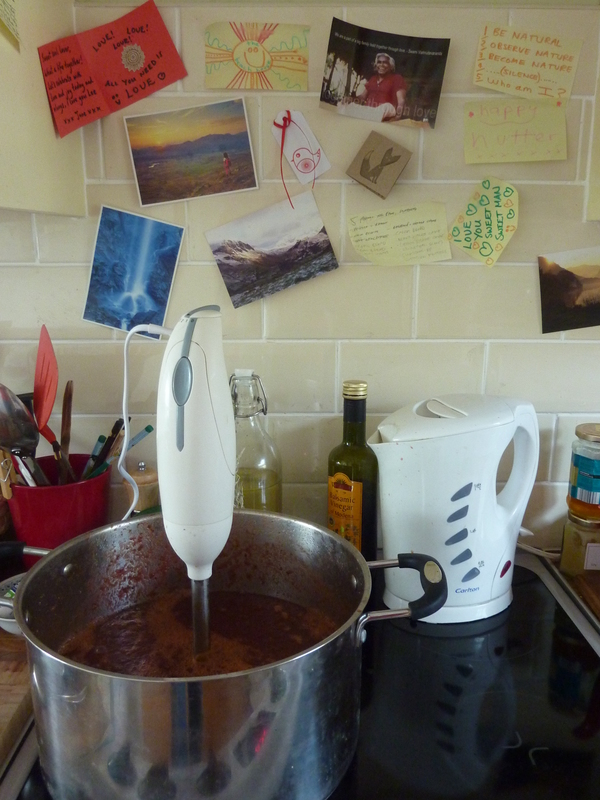 Then blend together using a hand blender or in batches in a food processor. The soup should be smooth, no lumps, check seasoning. In warm bowls, topped with some oregano leaves and fresh cracked black pepper. 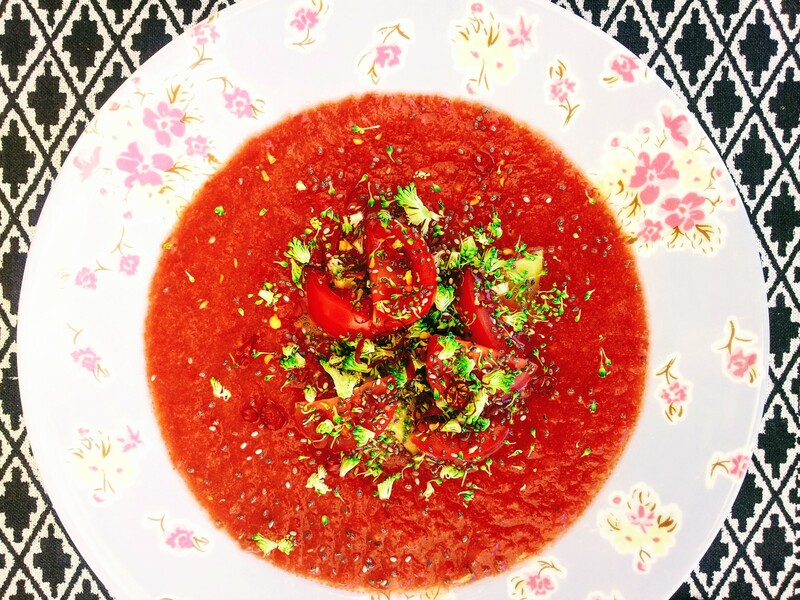 A great summer warmer (needed in these climes), we love the combination of balsamic and beetroot, sweet and tangy coming together nicely with the deep and hearty tomatoes. 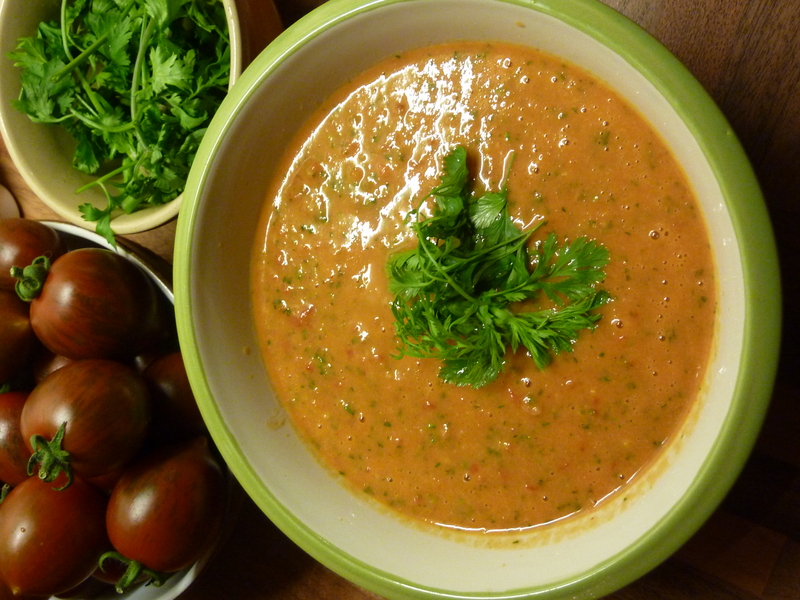 A lively, zingy soup, jam packed full of flavour and goodness. Having a good slurp. YUM! Beetroot leaves are full of fibre, protien and vitamin C, which we need constant supplies of because our bodies cannot store it. One cup of beetroot leaves gives you 60% of your daily dose of C. The best news is the vitamin A content, one cup contains 220% of your daily intake. Cor! They also contain alot of calcium, most people think that calcium comes from cows, but there are so many other ways of getting your calcium.